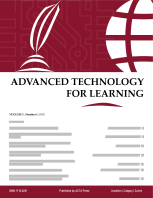 First published in January 2004, this journal already established itself as one of the leading periodical publications on all aspects and applications of advanced technology-based learning, teaching, education and training. They include but are not limited to innovative Web-based learning and teaching/training technologies, streaming multimedia technologies, reusable learning objects and standards for learning objects, authoring systems, intelligent tutoring systems, adaptive and adaptable educational hypermedia systems, Web services, Web-based collaborative learning, Web-based communication technologies, virtual reality and scientific virtual laboratories, innovative curriculum and courseware for technology-based learning, state-of-the-art hardware/software tools and systems, quality and assessment issues, virtual colleges and universities, online degree and certificate programs, corporate online universities, national and international projects in advanced technology-based learning. The journal includes regular and special issues on various hot research topics in designated areas, book reviews, best papers of international conferences on technology-based education and learning, information about conferences, call for project proposals, call for papers and new publications. It appears quarterly.